WASHINGTON, Sept. 7 (Yonhap) — U.S. President Donald Trump said Friday that he expects to receive a “positive letter” from North Korean leader Kim Jong-un soon as the two sides negotiate the dismantlement of the regime’s nuclear weapons program. Trump told reporters aboard Air Force One en route from Montana to North Dakota that the letter will likely be delivered by U.S. Secretary of State Mike Pompeo. South Korea’s chief presidential security adviser, Chung Eui-yong, made a one-day trip to Pyongyang on Wednesday and held talks with the North’s leader amid a deadlock in denuclearization negotiations between the U.S. and the North. Chung later said Kim gave him a message to deliver to Trump. Trump was apparently referring to the inter-Korean border, leading to speculation the letter could have been delivered during Friday’s talks at the border village of Panmunjom between the U.S.-led United Nations Command and North Korean military officials. It’s also unclear how Pompeo would bring the letter as the top American diplomat has been in New Delhi with U.S. Defense Secretary Jim Mattis for “2+2″ talks with their Indian counterparts. Trump and Kim have exchanged a number of letters since the U.S. president accepted the North Korean leader’s invitation to a summit to address heightened tensions over Pyongyang’s nuclear weapons and ballistic missile programs. The two held a historic summit in Singapore in June and agreed that the North would work toward “complete denuclearization” of the Korean Peninsula in exchange for security guarantees from the U.S. 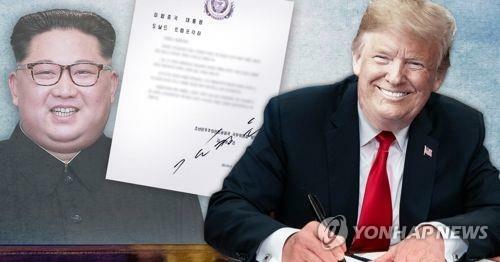 But negotiations to implement the deal have stalled as Washington demands an inventory of the North’s nuclear arsenal and Pyongyang insists on first declaring a formal end to the 1950-53 Korean War, which ended with an armistice. In his meeting with the South Korean envoy, Kim said he remains firmly committed to denuclearization and that his faith in Trump remains unchanged, according to Chung. Kim was also quoted as saying he’s never spoken ill of Trump to anybody.